It all started with Kennedy and Bundy, the brilliant young Harvard dean who became the nation's first modern national security adviser. While Bundy served Kennedy well, he had difficulty with his successor. Lyndon Johnson needed reassurance more than advice, and Bundy wasn't always willing to give him that. Thus the basic lesson -- the president sets the tone and his aides must respond to that reality. The man who learned the lesson best was someone who operated mainly in the shadows. Brent Scowcroft was the only adviser to serve two presidents, Gerald Ford and George H. W. Bush. Learning from others' failures, he found the winning formula: gain the trust of colleagues, build a collaborative policy process, and stay close to the president. This formula became the gold standard -- all four national security advisers who came after him aspired to be "like Brent." The next president and national security adviser can learn not only from success, but also from failure. Rice stayed close to George W. Bush -- closer perhaps than any adviser before or since. But her closeness did not translate into running an effective policy process, as the disastrous decision to invade Iraq without a plan underscored. It would take years, and another national security aide, to persuade Bush that his Iraq policy was failing and to engineer a policy review that produced the "surge." The national security adviser has one tough job. There are ways to do it well and ways to do it badly. Daalder and Destler provide plenty of examples of both. 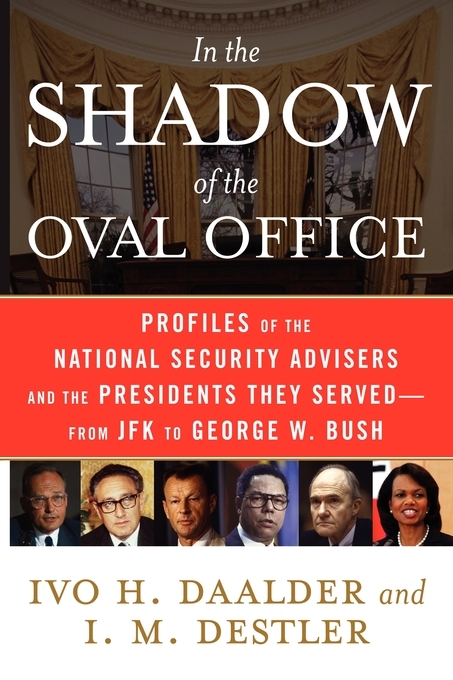 This book is a fascinating look at the personalities and processes that shape policy and an indispensable guide to those who want to understand how to operate successfully in the shadow of the Oval Office.